Have you ever been the Japanese traditional Sushi Bar,not the conveyor-belt sushi restaurant? 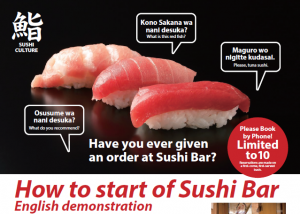 We offer you the very first step to experience at Sushi bar with English explanation. cult to order from various types of seafoods, which are beautifully contained in the case? English speaking guide will provide you some etiquette or common rules, which are accepted at any sushi bars all over Japan. You may be a “Sushi Bar expert” while eating tasty Sushi. The venue IPPEI SUSHI is popular, traditional style Sushi Bar. *Children under the age of 15 are not permitted to join. You can be a sushi expert now. When you make a reservation, I will ask you for your name, nationality, hotel name and email address.